The conference showcased the latest drone technology and previewed the industry’s prospects to a few hundred international buyers, vendors, and military figures. Inside a private conference room, political and industry leaders gave presentations — speaking in military euphemisms that avoided any uncomfortable references to the humanitarian catastrophe resulting from the 51-day bombing campaign. 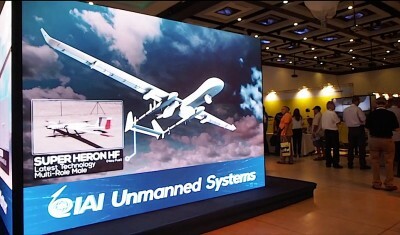 Elad Aharonson, General Manager of the Israeli weapons company Elbit Systems’ Unmanned Systems Division, praised the “relative advantage” Israel enjoys due to the “intimate ties” between the “developers and users” of the military industry. “In some cases, we must admit these are the same people and that is a great advantage,” Aharonson said. Within 48 hours of the first airstrikes of Operation Protective Edge last July, the military began operating the Hermes 900, nicknamed the “star” of Israel’s arsenal of drones. Made by the Israeli weapons giant Elbit Systems, the drone was “still undergoing test flights” when it was first deployed. The assault presented an opportunity to expedite the testing process by launching strikes on Gaza’s captive population — which allows Israel weapons makers to market their products as “combat proven.” This places the Israeli brand squarely at the top of the arms industry. This phenomenon is nothing new. Colonel Erez Karabiti, who heads the Israeli Air Force’s UAV division, admitted implementation of premature weapons systems has been the norm for at least 15 years — what he referred to as the “pre-standard era.” Though he praised the benefits of Israel’s use of premature weapons because it “brings results”, he suggested that in the future, the Israeli arms industry should adhere to testing standards in order to ensure reliability, effectiveness and, “obviously to sell” the weapons. Another aspect of Operation Protective Edge was the widespread use of Sky Rider mini-drones by ground forces — part of a program that Israeli troops pushed for and was first implemented in the Second Lebanon War in 2006. “Every brigade — even the reserves — got at least two air vehicles and flew them nonstop; at the same time,” the Israeli military’s chief artillery officer, Brigadier General Roy Riftin told a reporter. In front of the trade show was a team of Israeli high school students who were being groomed as part of the next generation of drone engineers and electricians. They operated remote-controlled robots designed to launch large yoga balls into a basket at a given height and distance. Their team was called FIRST Israel, part of an international competition that has been featured on National Geographic’s television channel. Nothing illustrated the complete militarization of the Israeli society so much as the interaction with Crosslab Networks (XLN). XLN is a project of the Reut Institute, an Israeli national security and socioeconomic policy think tank that has called on the Israeli government to “sabotage” and “attack” that global Boycott, Divestment and Sanctions (BDS) movement or what it described as an international Delegitimization Network. Under the leadership of former Reut Institute CEO Roy Keidar, XLN creates centers for 3D printing and other advanced technologies which are becoming an integral part of Israel’s ability to quickly design and build weapons. Keidar admitted that children as young as 14 were instrumental in building a mini-copter that could navigate the network of tunnels that Palestinian resistance groups had constructed. Footage shot by Dan Cohen and Lia Tarachansky with thanks to Ronnie Barkan for translation.